This week has been a really bad week on the eating well front. I have been having my normal salad and fruit lunch but I have been in a very snacky mood. So to top this off I thought I would have a curry night! A couple weeks ago I spotted that Sainsburys have a gluten free naan bread so I picked up a pack to have with my chicken korma and pilau rice. The sainsburys chicken korma ready meal is naturally gluten free, so it makes a quick meal! The naan itself is both gluten and milk free so although the korma ready meal does contain milk, you can always make your own. 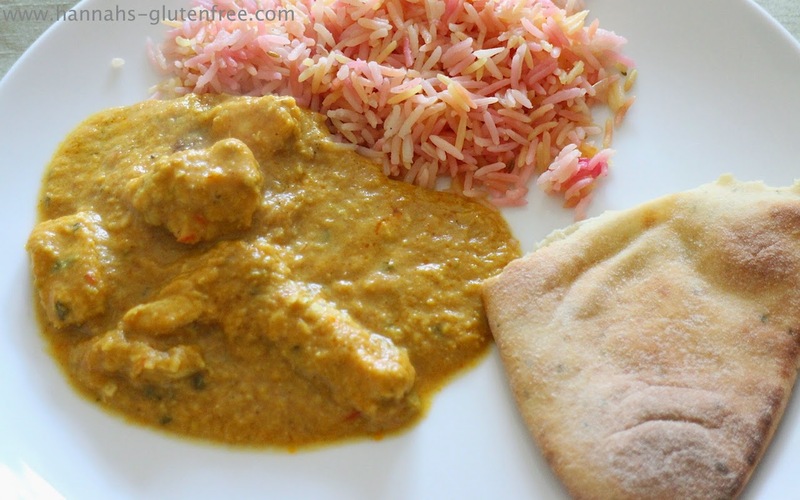 From past experience almond or coconut milk makes a fantastic korma! I found that this naan was amazing, so authentic to how I remember naan bread even down to the texture and the light dusting over it. I had some rice with my meal as I didn't know how good the bread would be, but I would definitely say you could replace the rice with the bread if you want to cut down on carbs as I know this is a calorie laden meal! A whole naan bread is 264 calories which really surprised me for the amount of bread and the density of it, as a piece of toast is around 100 calories each! The flavour of this bread was also very authentic, the subtle garlic and coriander flavour came through but it still had the essential flavour from the bread, which I feel is the most important aspect of a naan. At £2 a pack I think that £1 per naan is great value. If you are serving curry with rice I think one naan could serve four people easily as it is very filling. I don't think this is something I could create myself at the same cost or taste. Overall I have really enjoyed the naan , and my naughty eating week! I think the supermarkets own brands are becoming very competitively priced to mainstream versions which makes my purse very happy!